Diane is a member of OSSTF District 18 TBU, sits on the Provincial CPAC committee and teaches history, law and the social sciences at Centre Wellington District High School in Fergus. To see this post with images, please click here. In August of 2017 I travelled to Chile with an international delegation, supported by the Council of Canadians and the Heinrich Boell Foundation. Our delegation included educators from OSSTF, ETFO, Occasional Teachers, AEFO, ARM and two teachers who were refugees from the Pinochet dictatorship era. I was afforded this opportunity as the Co-founder and Chair of my local chapter of the Council of Canadians, and because I live in the Fergus/Elora area, ground zero in the water-mining fight against Nestle. You may have read about this local battle in Education Forum’s Water Warriors. After an odyssey of a flight Toronto to Santiago via Bogota, which included a missing MacBook and months of follow up with Colombian airport security (it was never returned), what followed was an extraordinary learning journey. Our delegation spent two full days absorbed in presentations by lawyers, union leaders, environmental activists, sociologists, political scientists and a smattering of doctoral and postdoctoral students — all while listening to simultaneous translation (I don’t speak Spanish). The context was important to understand how we got “here”. It was both an overwhelming amount of information and deeply inspiring to see the most vocal activists were mainly highly-educated young women who care deeply about the future of the country they love. In brief, we learned that the Pinochet government privatized much of the nation’s resources during the dictatorship — water is just one of them — and the effects are still being felt by the citizens, to the detriment of the most marginalized including the Indigenous population. With this context absorbed, we then spent days completing field visits: water treatment facilities, effluence dumping locales, and community after community after community to see what was happening on the ground. If you would like to read more about the Chilean historical context, this is a good place to start: The loss of the environmental patrimony continues unpunished. The city of Valparaiso, a UNESCO World Heritage City, is a major port city surrounded by a chain of 45 hills which are gloriously filled with riotous colours. You cannot avoid walking uphill — everywhere! The geography of the city plays an important role in this story. The wealthier homes front on to the main streets and were connected to Esval’s water and sanitation services. However, the poorer homes, which cascade down the hills into the valleys, were not connected. Esval refuses to connect them because, according to that corporation, they don’t “legally” exist as a dwelling. Esval has found a loophole in the interpretations of city blueprints and as a result has left thousands of Chilean citizens without access to a basic human right — water and sanitation. However, what we saw with our own eyes were municipal building projects of kitchens and bathrooms for these cascading homes, so at some point the local government HAD determined these homes were “real” addresses and provided funding to provide the basic building block for a home. What we also saw were many of these “non-legal” dwelling were connected to cable TV services. If the cable company is able to recognize these to be homes and provide bills to these addresses, the question was why can’t the municipal water and sanitation supplier? The answer it would appear is the cost of building the infrastructure to service these thousands of homes would be expensive. That would cut into their (our) profits…profits being paid out to us through the OTPP. This refusal to provide basic water and sanitation services drives people to desperation. The unserviced homes, in order to survive, are driven to “piggyback” onto the services provided to the house fronting onto the main street. There are several issues with this “water hack”. First, we saw thousand of metres of basic garden hoses attached to the main intake, which we learned not only provides insufficient flow, but actually release toxins into the water supply. Second, in many cases there were no sanitation services for these “piggybacked” homes, so raw sewage flowed freely down the valley. Finally, this “arrangement” left the most marginalized in a very precarious position. What if the main street house demanded increased or outrageous payment or services for this “piggybacking”? What if they just cut them off? There is no recourse for the unserviced houses should this occur. This “selective interpretation” of the bylaws means Esval retains more profit because they do not have to invest in infrastructure to ensure thousands of homes are supplied with a basic human right. While we might suggest that the local governments have a part to play in this, and they certainly do, what we are currently profiting from is this demand for profit. Another shocking sight was seeing fire hydrants, which were supposed to be operational, unconnected. The impact of this, in one neighbourhood was tragic, with a fire spreading through and destroying 3,000 homes. Equally disturbing, from a Federation standpoint, is the union-busting Esval facilitating. I met with union leaders who explained the time frame of the OTPP taking over as the majority shareholder of Esval was the beginning of contract outsourcing. This outsourcing mechanism is used to bust the union because contract workers are in far more precarious positions: they are paid less, have less job security, and unions are nearly impossible to form. While forming a union is legal in Chile, when contract workers attempt to form one Esval can, and has, summarily cancelled the contract, chilling the organized labour movement. If contract workers were ever successful in forming a union, their labour negotiations would be with their employer, not Esval, and employers do not take kindly to the risk to their Esval contracts. This outsourcing has been going on for a decade and they have almost successfully destroyed the union. We, as beneficiaries of the OTPP, will profit from this union busting. It was disturbing to learn that our unionized profession is part of a pension plan which purchased a majority stake in a corporation which profits from a human right while said corporation participates in active union busting to increase their profits for our pension plan. To be clear, Esval says they are not doing this. The OTPP also says Esval is not doing this. However, I stood there, ankle deep in raw sewage, with lawyers, engineers, activists and academics showing me that they very much are. …the privatisation scheme of a brutal dictatorship. …exploiting those most marginalized in Chile. …a resource that the United Nations has declared a human right. …a corporation that is actively working to destroy unionized labour in this sector. We must research this further to fully understand the majority shareholder status of the OTPP in Esval and the ramifications this ownership is having on the people of Chile. While I certainly don’t have all the answers, I am happy to answer questions via kdianeballantyne@gmail.com and I hope to have your support for this motion when it hits the floor at AMPA this weekend. Below are the motions being brought to AMPA by District 27, including the motion numbers. If you are an OSSTF Member and you support these motions, please let your local President know or post a comment below. We expect MAC 245 to be debated Saturday or Sunday since it will be a cost motion and must be done before the budget is determined. The others may not make it to debate, but we remain hopeful that AMPA delegates will think about these motions and perhaps take ideas back to their districts. Climate change is marching on and we hope OSSTF and the affiliate unions can be part of the solutions! In District 27, we are working on moving our local funds out of the big banks and our investments out of fossil fuels. We have heard other districts are thinking about the same. Solidarity! BIRT the Provincial Executive lobby the Provincial government to implement OSSTF Policy and Procedure 8.10.5. BE IT RESOLVED THAT AMPA direct the Provincial Executive and OTF Governors to request the OTPP Board of directors to direct asset managers to stop future investments in fossil fuel public equities and corporate bonds and actively invest in renewable and clean energy based securities. BE IT RESOLVED THAT AMPA direct the Provincial Executive and OTF Governors to request the OMERS Board of directors to direct asset managers to stop future investments in fossil fuel public equities and corporate bonds and actively invest in renewable and clean energy-based securities. BE IT RESOLVED THAT AMPA direct the Treasurer and managers of the Internal Investment Fund to stop future investments in fossil fuel public equities and corporate bonds and actively invest in renewable and clean energy-based securities. BE IT RESOLVED THAT the Provincial Executive ask the FNMI Advisory Workgroup, in conjunction with the Provincial Human Rights Committee, to make recommendations to AMPA 2019 regarding OSSTF investments, pension plan holdings, and financial dealings in light of the recommendations of the Truth and Reconciliation Commission of Canada. provide opportunities for Plan members across the province to discuss this report in open forum to promote understanding of the steps being taken by the Fund Managers to address the risks and opportunities related to fossil fuel holdings, including, but not limited to, the written report to the delegates at AMPA 2019. BIRT AMPA 2018 direct the Provincial Executive to lobby the Provincial Government to sue the fossil fuel companies for their contribution to the damage related to climate change. Support this year’s fossil-free motions at OSSTF’s Annual Meeting! For the fourth year, educator activists from the Educators Climate Alliance are putting forward motions to divest the Ontario Teachers’ Pension Plan and the Ontario Municipal Employees Retirement System from fossil fuels. Each year we have faced resistance, but we still believe that divestment is a crucial piece of the puzzle in helping push momentum for real climate action forward. The following is an open letter by ECA teacher activist Kevin Bowers supporting the motions, which are attached to this post. Teaching is a fulfilling career because we get to be explicit about the best parts us. We teach young people to be kind, thoughtful, and honest because we know it is the best way to build a life. The Educators Climate Alliance knows that teachers take the privilege of mentoring young people seriously. We also know that we are invested in an energy system that science tells us will lead to 4-6 degrees of warming by the end of this century. That means that students entering our schools today will experience unfathomable hardships. Scientists predict unprecedented refugee crisis, floods, food shortages, and diseases. Mentoring kindness, thoughtfulness and honesty is problematic when the pensions we earn in the pursuit of building better lives for our students is invested in a system that will bring deep and lasting hardship to our students. Teachers don’t want to be hypocrites. We know that kindness and honesty require that we be thoughtful about our investments. We need to protect our students as we lead them towards a better, safer, and happier future. Divesting the OTPP and OMERS is an important step we can take in the right direction. Please support this year’s motions at OSSTF’s AMPA to divest from fossil fuels. 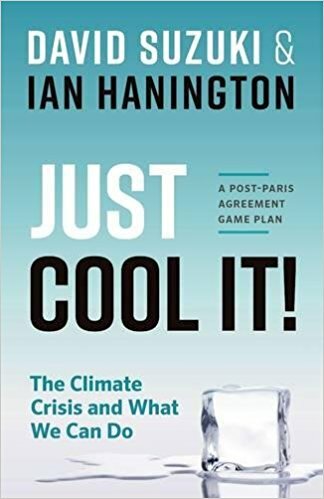 David Suzuki and Ian Hanington’s recent book Just Cool It! is another book, like Naomi Klein’s This Changes Everything – that really ought to be required reading for any global citizen, and especially, one might hope, any political leader or decision-maker in business or, of course, investments and pensions. One of the central ‘take-home’ messages of these two books is that our economic system must change if we are to have a hope of mitigating climate change, for the good of humanity and other species. The system is rigged to put profit above all other concerns, and as long as that remains the case, we’ve got a huge problem. Myopia (with no offence meant to nearsighted people!) and greed are hard-wired into capitalism, and we have to get out of business as usual before it’s too late to change course. I’ve taken the liberty of inserting the relevant pages from Suzuki and Hanington into this post. They agree that divestment is a useful tool. There continue to be some voices out there that look down on divestment, as evidenced in this article from last winter. There are many quirks and contradictions in this particular article, and I won’t bother refuting them in depth, though I will suggest that a focus on nonviolent tactics should always be our goal. One of the main recurring arguments against divestment is that divesting doesn’t accomplish anything, when fossil fuel shares will simply be purchased by another entity. This argument misses the point, however, on a couple of levels. To say the divestment movement targeting South African apartheid – or oppressive Israeli military occupation in Palestine – was, or is ineffective, simply because other investors will buy divested holdings tied to these outrageously unjust situations, is simply a moral cop-out. Climate change, justice for indigenous peoples, a living wage, oppression in Israel-Palestine, women’s rights, queer rights – all of these causes need us to open all of the options in our activist toolkits to take action. Thinking of climate change in particular, we need every tool available to wage the type of mass cultural struggle that is necessary to attempt to effect change. We need to think about divestment as one tool in a broader toolkit for nonviolent action. We need all the tools we can muster to wage this struggle. As a broader and separate conversation, I do believe the question of the efficacy of tactics is critical. I would prioritize two central criteria to gauge the efficacy of any tactics for mass movement building for social and ecological justice, namely nonviolence and the capacity of chosen tactics to contribute to mass movement-building. These ideas require a separate essay to address, but a powerful argument can be made for divestment relating to the second of these criteria. Divestment is not simply an economic tactic – reading it as such is missing the point. It is rather a movement-building tactic. It is essentially a tool for public education and consciousness-raising, more than, or even rather than an economic ‘weapon’ per se. We need to engage the global citizenry about the urgency of climate action, and divestment is one way we can do that, since most of us in the global north, and beyond, are tied to the capitalist system of fossil fuel-based profiteering. This point brings us back to the ethical dimension not taking action on climate. Regarding pensions and endowments, we must agree that it is simply wrong for to base a retirement security for workers, or the profitability of investments, on ecological degradation and climate change. 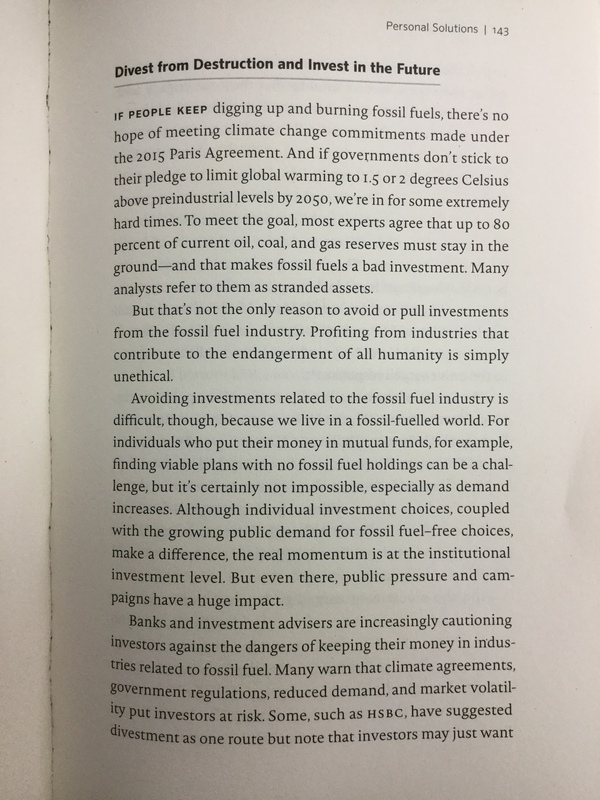 This alone provides reason enough to divest, and that is the basis of the brief I authored to anchor the Educators Climate Alliance campaign for the OTPP and other public institutional investments to get on board with fossil divestment. As Suzuki and Hanington, and many others have continued to point out, fossil fuels are not the best future for investment security. Whether understood through the lens of ‘stranded assets’ or ‘carbon risks’, this argument stresses that with a post carbon future inevitably ahead, fossil fuels are a risky bet. Many even point out that decarbonized portfolios are posting better results that their carbonized counterparts. The Montreal Pledge has been a successful movement to bring institutional investors on board to voluntarily decarbonize investments and disclose their ‘carbon risk’. If we pretend institutional investments aren’t part of the problem, and cannot be used as vehicles to create increased pressure for climate action, then I suppose we could ignore divestment as a tactic. As it is, and considering the importance of institutional investments such as pensions to the functioning of global capitalism, we need divestment as a tactic. There’s capitalism cropping up again. While we pressure for divestment from whatever personal circumstance we live in – through our pensions, the Canada Pension Plan Investment Board, university endowments, etc., we do need to keep our eye on the larger stakes, as Klein, Suzuki and Hanington take care to remind us. Institutional investments are part and parcel of a system that breeds zero accountability to the climate, or to anything else, like workers’ rights, indigenous rights, women’s rights, children’s rights, water, you name it. The definition of ‘fiduciary’ duty to shareholders’ is based on the principle of high returns and profits only as the benchmark for meeting that duty. This has to change, despite European activists’ attempts to harness the concept of fiduciary duty as a tool to press for fossil fuel divestment. Ultimately, we don’t just need decarbonized investments – we need a decarbonized economy, and we need effective and deep democractic control and planning of our economies to do that. We need progressive regulations, taxes and programs that draw down fossil fuel use in energy, transportation and foods, and scale up sustainable energies for these key parts of human civilization. Yes, we need divestment, and we need it to be a part of a mass movement that can press for effective action. We need to press our political parties to adopt radical policies that can push for effective climate action, away from failed carbon offsets and cap-and-trade schemes. We need to do all of this, together, for ourselves and for future generations, and we need to keep thinking of creative ways to educate and engage more and more people to inspire others to take action. Thank you David, Ian and Naomi for reminding us of all of this, and for inspiring us to keep the struggle alive. *The author thanks Brian Young of Toronto 350 for feedback on this article. Watch Jeff Rubin’s public lecture on divestment from fossil fuels hosted by Divest Waterloo and the Centre for International Governance Innovation on May 11. Jeff Rubin is a CIGI senior fellow, former chief economist at CIBC World Markets, and thought leader on the economics of energy sources. 1. If we don’t invest in fossil fuels, someone else will. This is sort of like Stephen Harper’s argument for Canada’s opposition to ambitious climate targets at the UN climate talks – unless the big players like US and China were going to do it, Canada wouldn’t bother. He argued that Canada’s contributions to carbon emissions aren’t significant on the global scale, absolving us of responsibility. Mental health/control freak tip: You can’t control what others do. Do it because it’s the right thing to do. Do it for Indigenous communities whose rights are violated. Do it for future generations so they might inherit a livable planet. 2. Divesting won’t hurt fossil fuel companies. Ronald McDonald probably won’t be hurt if I don’t eat Big Macs either, but it doesn’t mean I should eat them if I don’t want to. I DON’T WANT A BIG MAC. 3. We will lose money. It’s possible, but… [Sarcasm alert:] That’s the first thing that comes to mind when I close my eyes and see the pictures of police hosing down Indigenous People and other land defenders with water cannons in sub-zero temperatures at Standing Rock last November. 4. Engagement with fossil fuel companies is a better strategy. Maybe. But I don’t believe it. First, because according to strong science, we only have a carbon budget of about 500 gigatons – about 15 years – to transition off fossil fuels to maintain a livable planet [www.keepitintheground.org]. In other words, at least 80% of known reserves have to remain in the ground. How do you engage with a fossil fuel corporation on that premise? There is no ‘good’ way to burn unburnable carbon. And 15 years?! We don’t have time to engage! Secondly, this isn’t an either/or argument. We can engage away while we have ownership. Engage and tell the fossil fuel giants to stop hiding the evidence of anthropogenic climate change. The time to act is now. Any how. Any way. We need to make a shift. We have all the technology we need to make the transition. Let’s take into our own hands that which we can. We don’t have to invest in fossil fuels. We don’t have to support corporations which are notorious for abuse of Indigenous rights. We have a choice.